How do you organize and store your music? Physical media, I mean. Like many audiophile LP collectors, I have at times struggled with keeping my ever-expanding collection under control. I’m not planning to stop acquiring new vinyl, so my need to better organize it is likewise growing. Enter Koeppel Design, a small, crafty, San Francisco-based company launched in 2013 that has carved out a niche for itself designing and manufacturing high-quality organizational solutions for collectors of music and other media. A longtime record collector herself, founder and visual designer Kate Koeppel (the “o” is silent)—who also runs her own graphic design practice—became frustrated by the lack of functional and elegant solutions for storing and displaying her LPs. The only such products she came across were nearly all poorly made, plastic, or ugly (or all three). So this prompted her to create her own organizational solutions perfectly suited to the experience of accessing, handling, and playing records—the analog ritual. Koeppel Design’s offerings range from assorted record dividers with engraved or stenciled cut-out letters to stackable storage crates and a record tote bag. 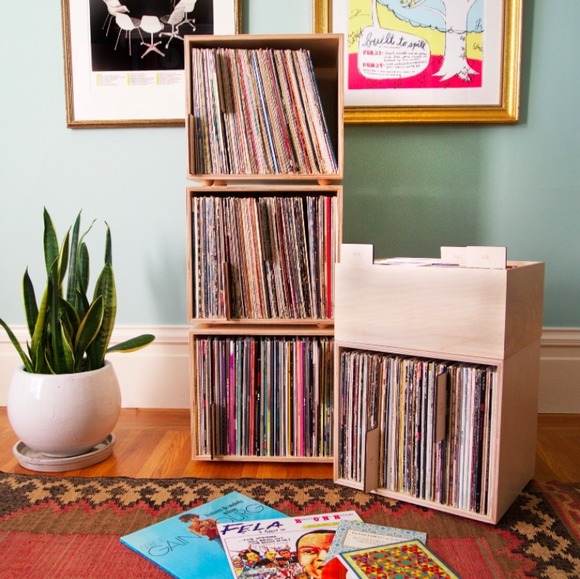 All dividers and crates are made of beautiful, high-grade, multi-ply European birch. The company of craftswomen works exclusively with California-based suppliers, printers, and other small businesses to produce its goods. Custom orders are also available for other kinds of storage/dividers for CDs, DVDs, 10-inch records, books, and so on. Koeppel can even create file cabinets or the storage setup of your dreams, and also is a supplier to a number of record stores, radio stations, and the Rock and Rock Hall of Fame + Museum Library and Archive. Koeppel sent me a full alphabetical set of her wooden record dividers (in a vertical orientation, though they can also be had in a horizontal configuration), one for each letter, with offset tabs so all the letters are visible. Several options are available; it depends on how you prefer to organize your discs: partial alphabetical (A-F, G-L, etc. ), by genre, by decade, or whatever else your little heart desires (see sidebar). (My audiophile father organizes his huge LP collection by record label, so he’d be a good candidate for a custom order of record dividers labeled Decca, Deutsche Grammophon, RCA, Philips, EMI, etc.) From the moment the heavy boxes arrived, I knew the makers were serious about their craft, though they also have an irreverent sense of humor: A tagline on a sticker included in my shipment read: “We will help you get your sh*t together.” Even the paper packaging tape was Koeppel-designed, well made, and witty, with small line illustrations of tiny turntables, amplifiers, headphones, desk lamps, etc.